Emerson Process Management announces enhancements to its process acquisition controllers to provide greater visibility into oil and gas custody transfer and fiscal flow metering installations. Emerson’s new release of the Daniel process acquisition controller, DanPac Version v3.0 builds on the system’s ability to reduce measurement uncertainty, facilitate remote monitoring, and control high precision oil and gas custody transfer and fiscal metering systems. The new release includes the CalPac metering software suite comprising of a number of applications developed to automate flow measurement calculations and data processing, including gas and liquid calculations, measurement uncertainty, and meter factor trending. Integrated historical system performance, and process trending capabilities enable operators and management to monitor the metering system. 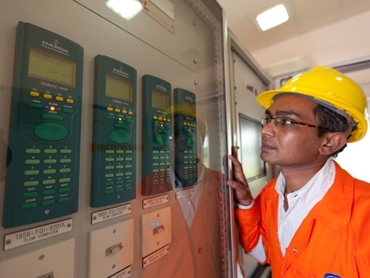 Operators can identify potential meter problems before they adversely impact system performance. The applications allow automated online validation of metering data in accordance with industry standards, including API, ISO and AGA, to minimise errors and satisfy audit trail requirements. The DanPac v3.0 process acquisition controller also includes a powerful enterprise class web-based reporting application to enhance accessibility and audit traceability. The platform provides secure and encrypted PDF reporting capabilities eliminating the possibility of data manipulation and safeguarding the integrity of custody transfer and fiscal metering transactions. Users can also customise reporting content and layout to fit their needs. DanPac can easily integrate with a broad variety of DCS hosts and SCADA systems to provide metering information. Adopted by all major oil and gas companies, the DanPac process acquisition controller has been used on custody transfer systems on every continent with its sophisticated technology replacing a longstanding industry approach that didn’t provide the required reliability, ease of serviceability, robustness, and cost savings. By implementing the DanPac solution, customers have been able to benefit not only from a standardised control system with integrated engineering and operations environment, but also from a single point of responsibility for global, consistent, and rapid support services. Steve Colella, vice president and general manager of Daniel’s global metering systems business comments that the DanPac system fulfils industry’s need for a standardised and smart fiscal metering control system that can help operators lower their cost of ownership, increase utilisation, and speed up system support. He adds that investment ROI and operating expenses are positively impacted using the DanPac solution, which can provide much greater visibility to the skid systems by using web-based reporting with advanced diagnostics and applications embedded in the control hardware. The DanPac solution is available in four flexible system configurations to ensure a cost-effective solution regardless of the size of the metering operation. DanPac v3.0 process acquisition controllers include a logic controller and the Daniel S600+ flow computers.